Having visited Bristol several times but only on day trips, I was excited to finally get to stay around for a few days and explore Bristol, as I checked in to the Rock ‘n’ Bowl hostel in downtown. 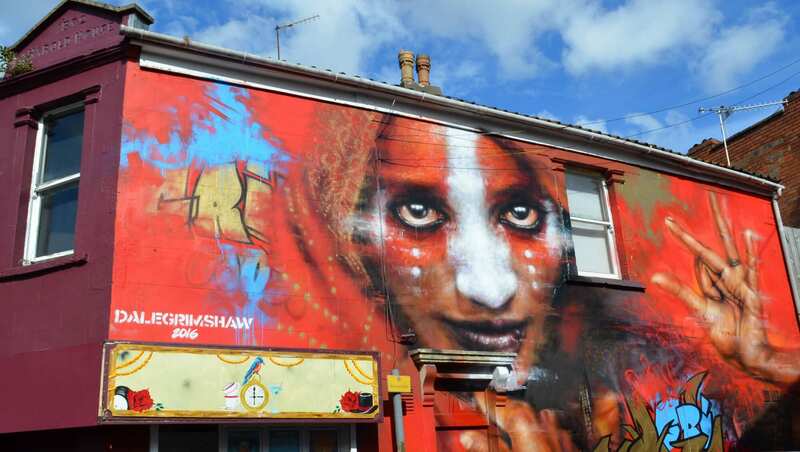 Its entrance is found just around the corner from the street art adorned Nelson Street, and conveniently located between all the big contrasts of Bristol’s diverse neighbourhoods. The hostel itself is decorated with cool street art too, on the walls of the open and shared spaces, which makes it blend in well with the area. The staff are welcoming and friendly and the the facilities are modern and feel very safe. One bonus of this hostel is the connected bowling alley downstairs, which offers plenty of entertainment for nights out or rainy days. Whether you’re into high street shopping, old markets, street art and urban vibes, culture along the harbour, or posh neighbourhoods and big attractions – Bristol has got it all, and most of it within walking distance of the Rock ‘n’ Bowl hostel. Just continue up Nelson Street and you’ll reach the buzzing Broadmead area where you can shop til you drop in all the familiar brand stores. I prefer to go the other way though and dive into the atmospheric St. Nicholas Market, which is spread out in several buildings. Here you’ll find anything like old stamps, clothing, second hand books, sweet treats and lots of other things. 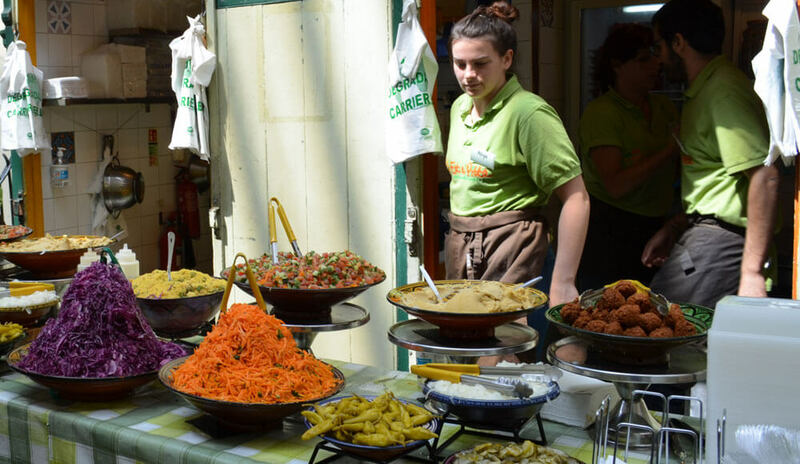 I’m especially drawn to the foodmarket part, which is a pleasure just to walk through – and almost impossible to resist. When you’ve had enough of shopping, Bristol has plenty of free entertainment on offer. Not at least it’s famous street art, which is found everywhere really, but highly concentrated around the underground Stokes Croft area, Nelson Street and the surroundings, as well as in the neighbourhood of Southville, south of the city centre. This time I focused on the latter, as I took a stroll down through North Street which recently had been part of the annual street art festival known as ‘Upfest’. All along this street I found beautiful art works and I really enjoyed hunting these with my camera. And of course you can’t forget about Banksy when you visit Bristol, who still has a few works spread around the city – so ask at the tourist information for info on where to find them. Other than the urban art, the harbour is what gives Bristol a lot of character. I love a stroll down the waterfront where you find the tourist information and the ‘Watershed’, which includes a cinema and a café and generally is cultural hub in the city. Another “shed” you shouldn’t miss is the ‘M Shed’ just across the canal, easily spotted behind the four giant dock cranes towering in front of it. This is a free city museum and a great place to learn about Bristol. This time I chose to board another ship though, as I wanted to check out the mighty SS Great Britain. This former passenger steamship is no longer conquering the seas, but is now a spectacular museum ship at the dry dock and one of the city’s greatest attractions. She was the longest passenger ship at her time and originally built in Bristol. This was my first visit to the ship and I was amazed about how beautifully it had been restored. I also loved the way the story about the ship’s long life and “resurrection” was presented, in a very entertaining interactive way. You can spend hours just wandering around all the decks and checking out all the details. Another first for me was a visit to the iconic Clifton Suspension Bridge, spanning the Avon gorge with the river Avon running below. Found on the edge of the posh Clifton neighbourhood. The is a big contrast to downtown’s street art clad buildings, but a lovely place to go for a walk. And the view to the bridge is just unique. I’ll be looking forward to my next trip to Bristol, and wouldn’t hesitate to check in to the Rock ‘n’ Bowl hostel ROCK AND BOWL again. Want to explore Bristol more? See our map for more accommodation in and around Bristol.